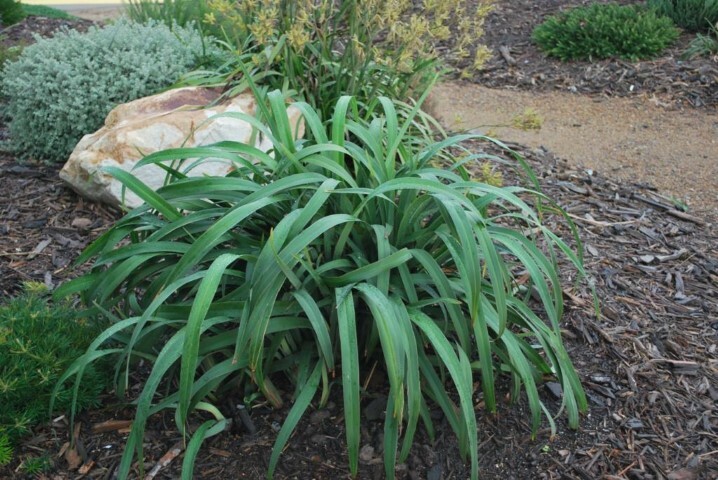 Dianella (also known as flax lily), are a great choice for your garden as an alternative to other trendy grasses. Strong and beautiful, they are low maintenance and never disappoint. With attractive strappy foliage, sweet perfumed flowers, and showy non-edible berries to follow – what’s not to love? They can be planted en masse, look excellent as a border, dotted amongst other plants for interest, and even suit container planting. They thrive in a broad range of conditions too, and are extremely reliable. The good news is, at Austraflora we have lots of choice when it comes to Dianella! This particular Dianella has a ruby tinge at the base of its leaves – just glorious! We also love the graceful flower stems and deep blue flowers. Growing 75cm high and suiting just about any garden. An elegant choice with hardy and handsome foliage, deep blue flowers and purple berries. Reaching a metre in height and tolerating a broad range of conditions. Dianella Seaspray is more of a dainty variety with its finer blue-green leaves. Ideal for adding colour and texture in landscapes, and looks wonderful mass planted. We absolutely love the grey-green and white striped leaves. Dianella Silver Streak (TM) is an exciting choice and would make a nice formal border or pot plant. The blue flowers are held high above the foliage. A great low maintenance border and alternative to other small grasses. This little Dianella only reaches 35cm high, and it is compact and simply perfect. Sky blue flowers perch above the leaves in spring-summer. Featuring a compact habit and short, sword-like leaves. Spikes of bright blue-purple flowers appear in spring and summer and these are followed by glossy, deep blue berries. If you’re looking for a smaller, easy-care plant, this one is for you!